One perk of moving out is that I have now a lot more space for all my hair and skincare products. I will be doing a post very soon showing you how I store all this but in the mean time here is what I currently use on my face. First up I use the L'Oreal men expert hydra energetic charcoal face wash. I know it is a mens product but over the years my skin has spent so long in harsher environments I need something a little stronger. This face wash is working worders on my skin and I have noticed a huge difference since using it. I then add on the No7 pore serum as my pores really needed some work, since using this daily I have noticed my pores are really reducing which is great to see. I then add on a quick spritz of this Lush toner water which although I don't like the smell of it I really like how it leaves my skin. 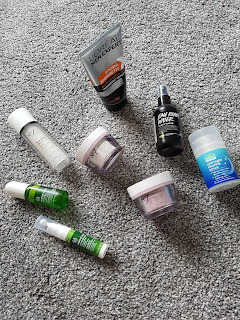 Next up is my Body shop drops of youth items, I seem to have been cursed with the same dark circles under my eyes as my dad so I am doing my best to try reduce these. I then use the concentrate just to get my skin looking healthier. The final step on a morning is applying just a little of the No7 day cream to leave my skin nice and moisturised. On a night I will simply cleanse my skin with my T-Zone charcoal wipes and add a bit of the Witch blemish reducing serum and finish off with the No7 night cream. Since using this combination of products I have really noticed my skin looking a lot healthier and have also noticed a reduction in spots. So there you have it that is my updated skincare routine for both day and night. Think of anything I could add? Let me know.